The mention of ‘vintage lamps’ usually brings to mind ornate metal lamps with elaborately embroidered shades. Well, it is time to move on with the ones in this list. 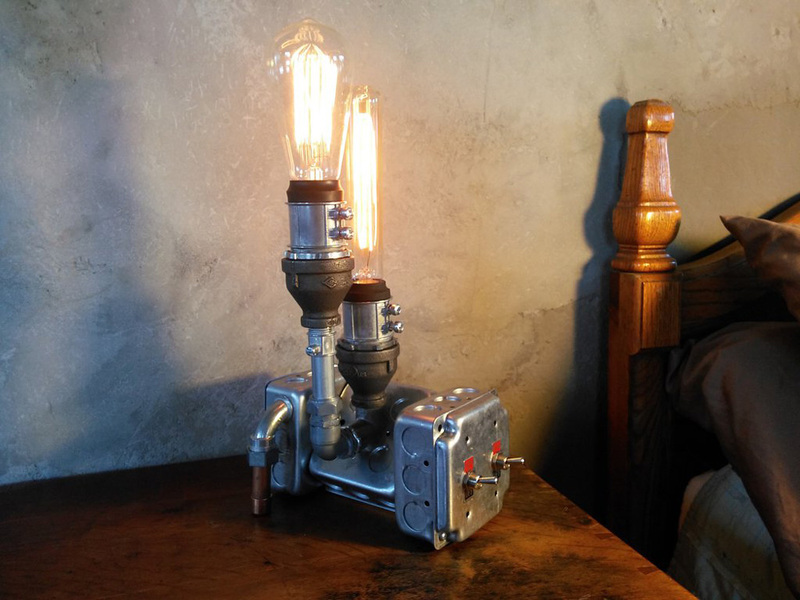 Made with old fittings, these lamps with a touch of the avant-garde are perfect tributes to the spirit of adventure. 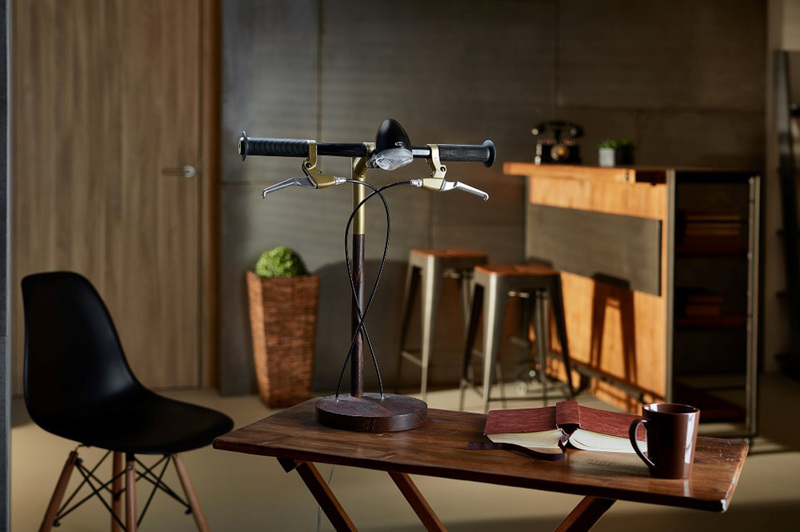 Designers from Industrial Kid have found a good way of reusing disused bike handles, brake levers, Bowden cable hosing and stem, and grips. They have turned them in to beautiful lamps sleek and lean in shape. They are available in 10 different colors like strawberry smoothie, chocolate brown and kiwi lime green. Made to compliment any room willing to experiment, the fun bit is the handlebars which can be used to switch the lights on and off. 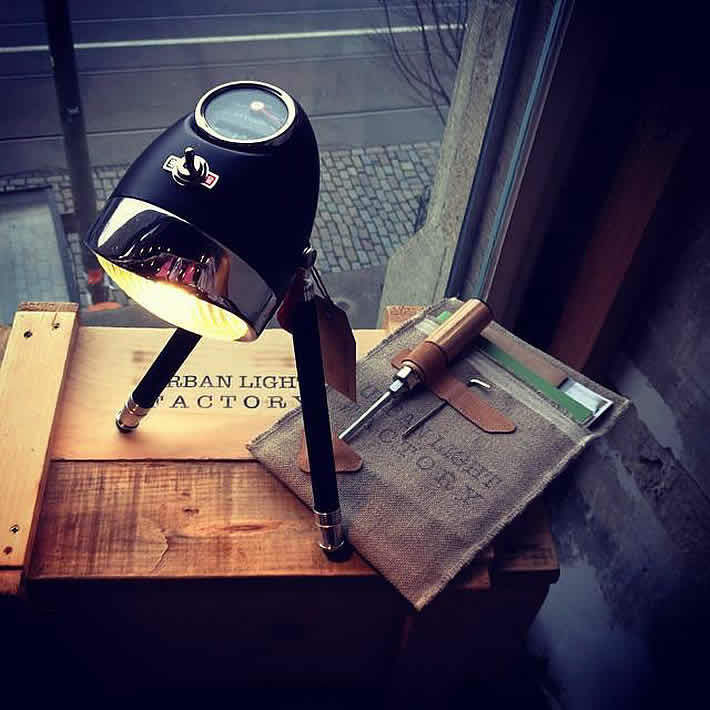 You can’t imagine how beautiful old headlamps from cars , motorcycles and farm tractors can be till you buy these tripod-based work lamps and hanging pendants created by Berlin-based Urban Light Factory. Their exteriors are left unpainted after rewiring to add to the vintage quotient and make you a part of all the journeys the lights have gone through . There is a booklet explaining to you the history of each lamp. Even the boxes used for product delivery are vintage and made from scrap wooden material. The company’s thoroughness is evident in the care they take even after product delivery. Because each lamp comes with its own custom tools which you would need every time while changing the bulbs. So, life has moved on to the extent that you no longer use those good old Edison lamps. Australia-based company Edison Light Globes is there with its beautiful classical, pendants and desk lamps for those who are not yet ready to part with their filament bulbs. The heavy brass fixtures with exposed hardware lend a steampunkish vibe to these classically aesthetic pieces. 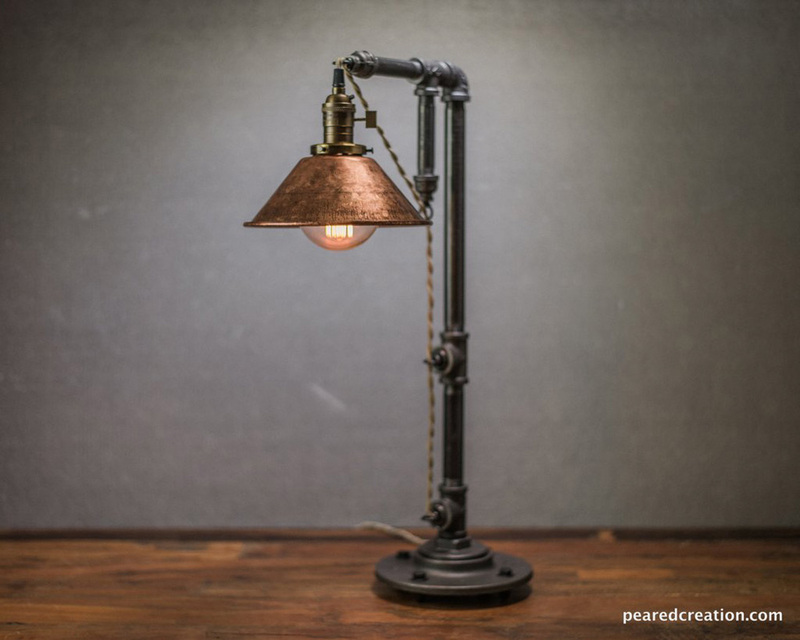 Don’t be misled by the name as this 26” lamp is actually designed to fit any décor from rustic to industrial with its 60-Watt Edison bulb and 8 inches copper shade. Made from industrial themed black iron piping, the shade is adjustable by threading the vintage style cloth cord along the metal loops. These vintage metal Edison lamps from Luxma with industrial fixtures are the perfect choice for those willing to put in something vintage. 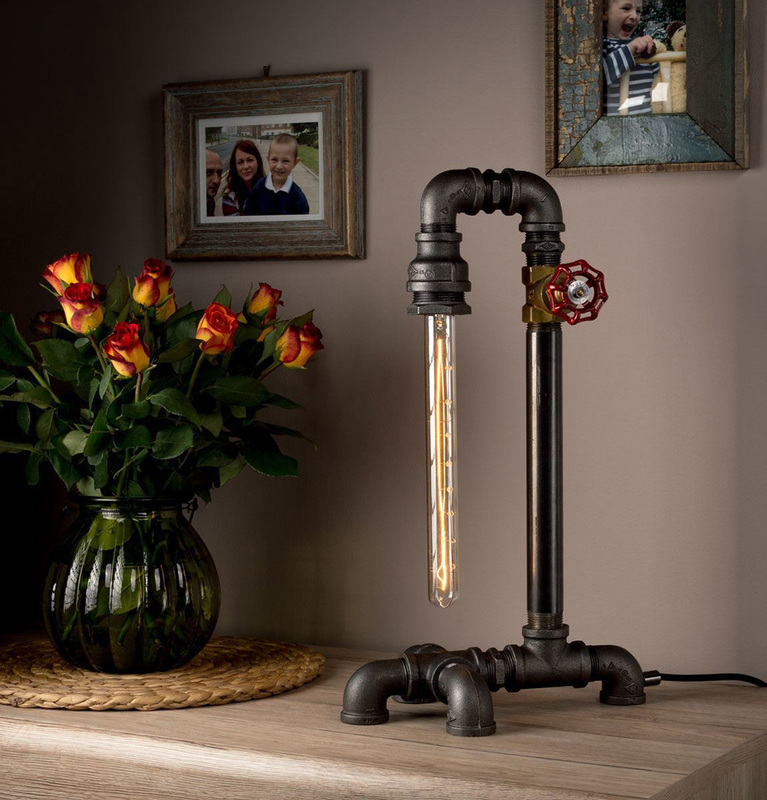 The metal fixtures like iron pipes and mechanical parts make these lamps suitable for any kind of room decor . Made to fit the needs of small tables, these compact lamps measuring 31 centimeters come with two 40 watt bulbs. 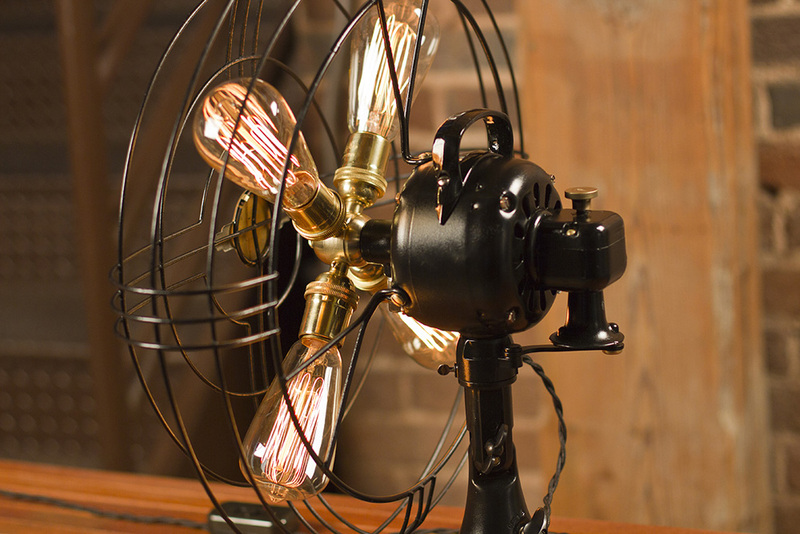 These are single bulb lamps made by Luxma with the same steampunk vibe but especially for those with a modern outlook. 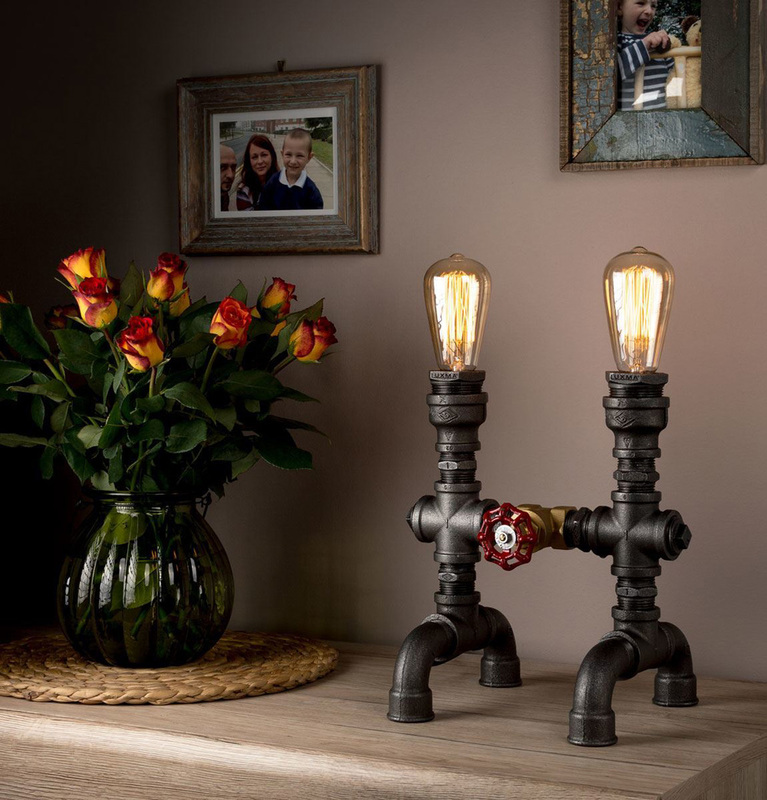 These handmade art lamps have bodies made of industrial iron pipes and base and joints made with mechanical tools and accessories. These are fitted with 40-watt lamps. Without a bulb, the lamps are 51 centimeters tall and 19 centimeters wide. Constructed from heavy-duty industrial metal piping, its coolness lies in the high-end antique brass socket that has a vintage on/off key. 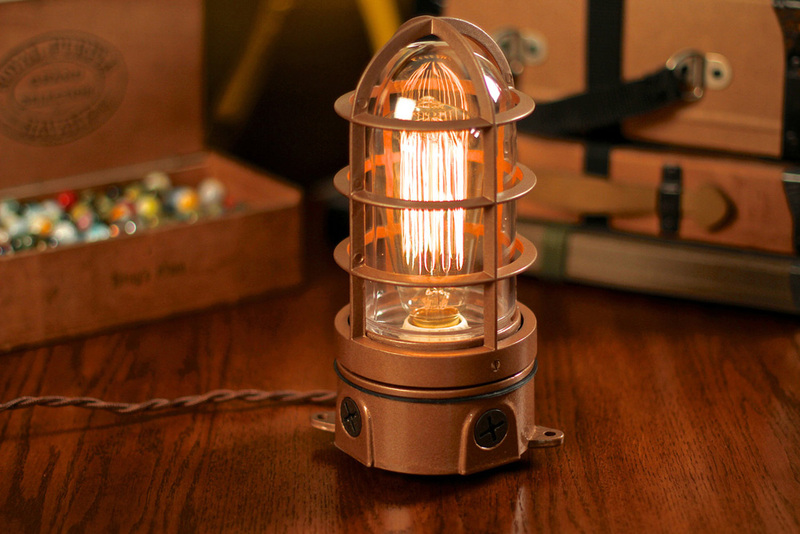 There is a 60-watt vintage filament bulb with 8 inches aged copper shade. Each of the pieces is handcrafted with care. Also, the lamp can be adjusted to control the height as well as the angle of the shade. This is not for the light-hearted . With a simple, bold and genuine design, the Milton Douglas SP-1 is made to bring in light and warmth to any desk. Made with galvanized bright silver-grey extremely solid iron pipes, this is so cool that you can adjust the amount of light by touching it anywhere. The rubber feet help in keeping all surfaces scratch free and the 8 inches Rayon wrapped cord gives it an antique feel. Move aside your pipes and headlights! 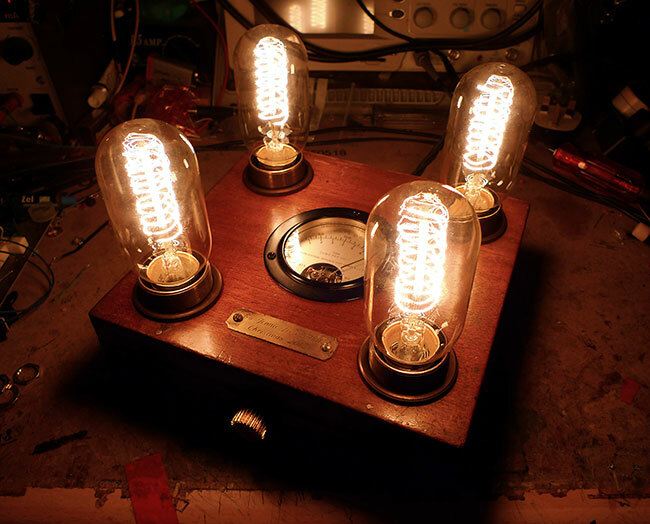 For here is the radio speaker table lamp! Made with the 1920s style Atwater Kent Radio Speaker, you can customize yours while placing the order. 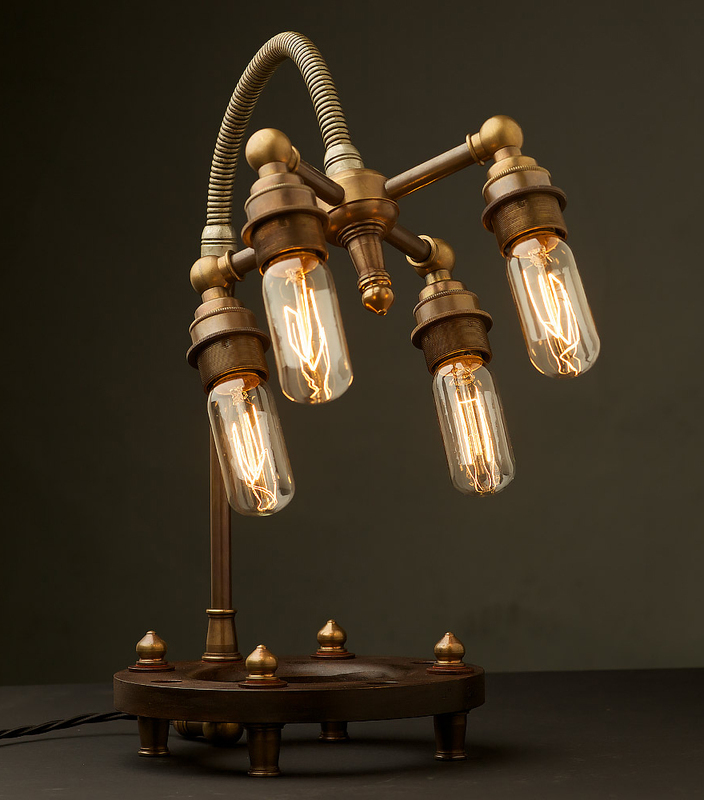 The Edison bulbs fitted to the polished body made of bronze, cast iron, copper and brass give it an inimitable golden glow. 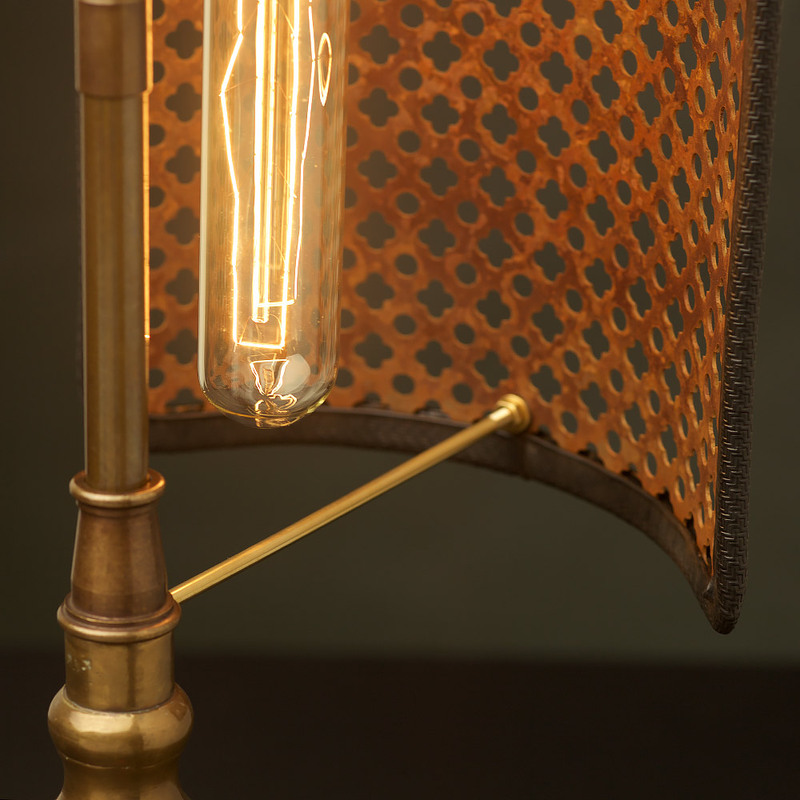 This industrial explosion proof caged lamp is the perfect piece for those willing to add a unique charm to their bedside. The design makes it perfect for any ambience, whether it be restaurants or offices. The 40-Watt vintage bulb comes in an extremely durable body and is very easy to replace. 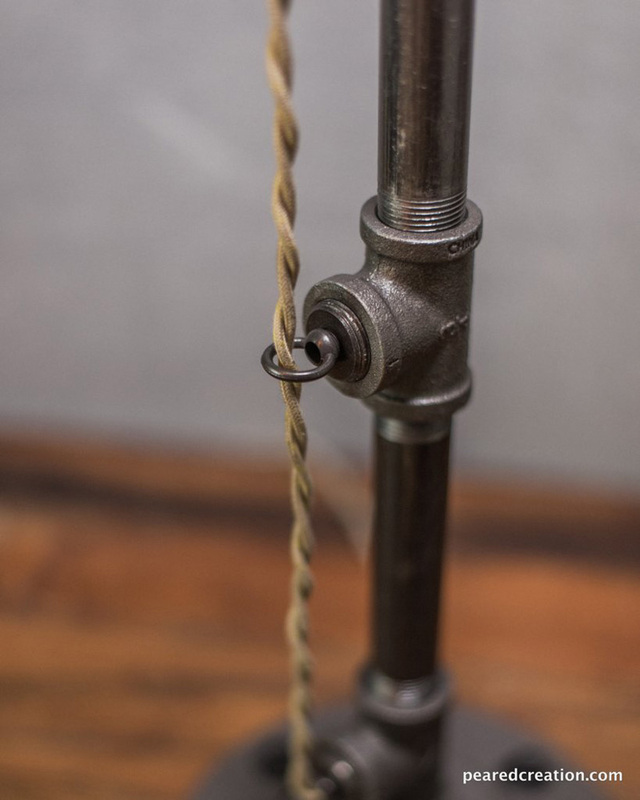 The Walnut braided iron cord gives the 9.5”x4.5” lamp a vintage charm and features a Toggle switch on the cord. 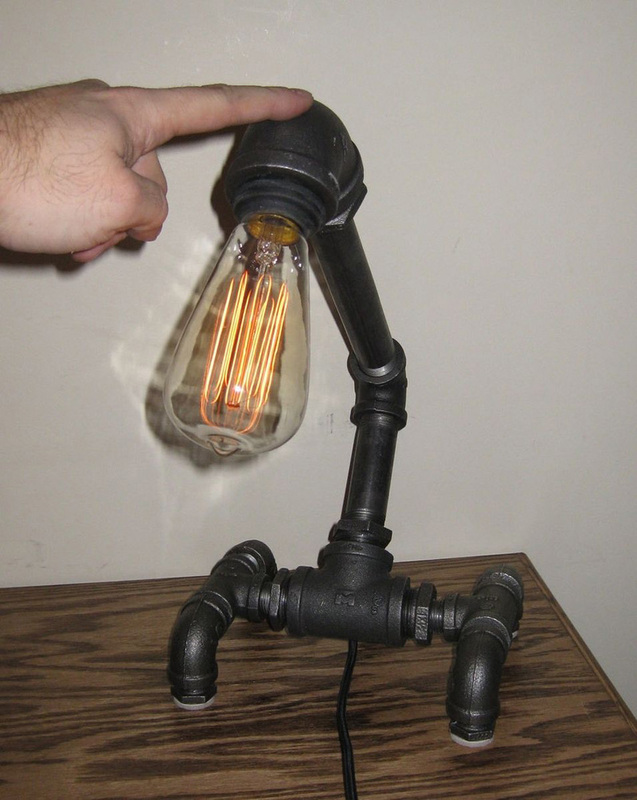 As the makers say on their website, this lamp was originally made as a Christmas present for someone in 2013. But it became such a hit that they thought of making some more models. And reading the details, you will understand the care they take to make these. It is a slightly heavy piece and is best made for spots where they would be the center of attention. 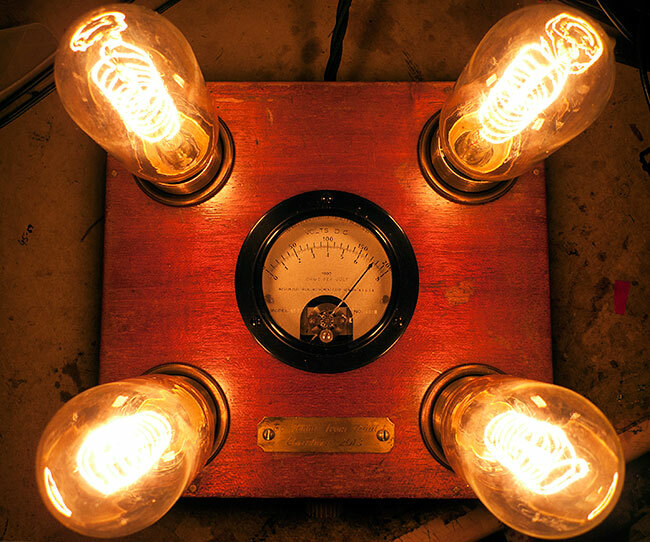 A typical lamp comes with not 2 but 4 Edison bulbs and a voltameter carved out on something which might have been a cigar box. E verything is custom made. You can definitely give one of these models a try or go through their account to make one for yourself. This lamp can go with any décor, either classic or industrial, and is the perfect piece for those who prefer things portable and neat. 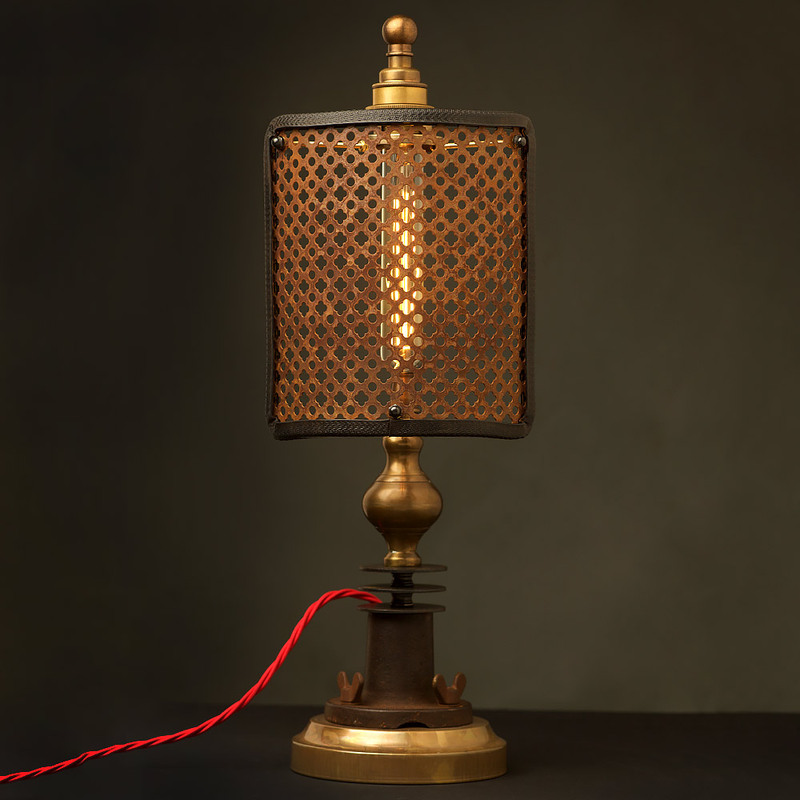 Made with brass, this lamp in rich brown comes with a beautiful rope detail on the stand that makes it aristocratic, a look completed by the dark leather on the shade and the base. 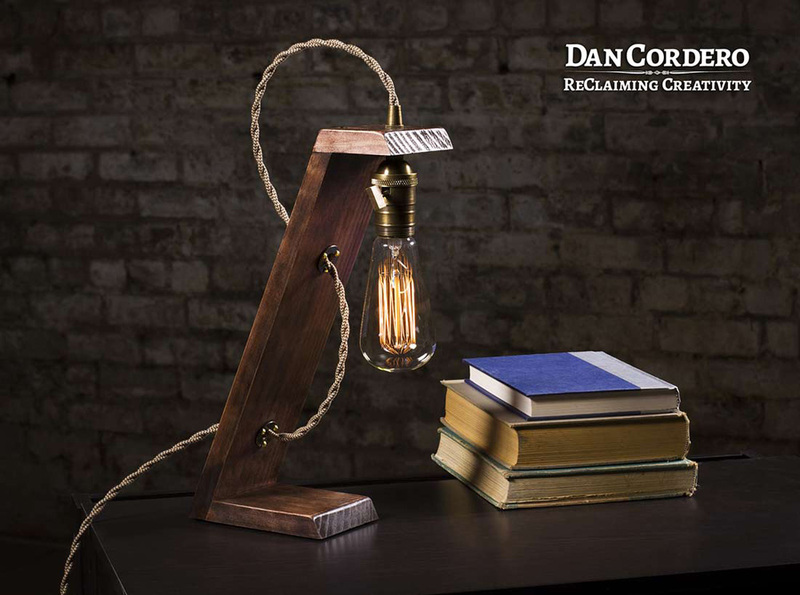 This is the perfect table lamp for big libraries with wooden shelves and old books. Having dimensions of 250 mm x 660 mm, these lamps weigh 5 kgs. Each piece is hand moulded . 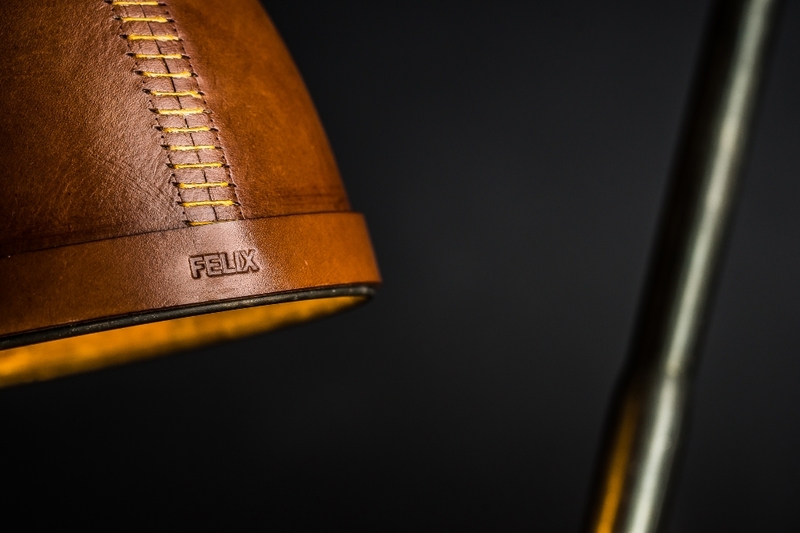 The leather lamp on the black leather base is the sexiest combo one can think of. 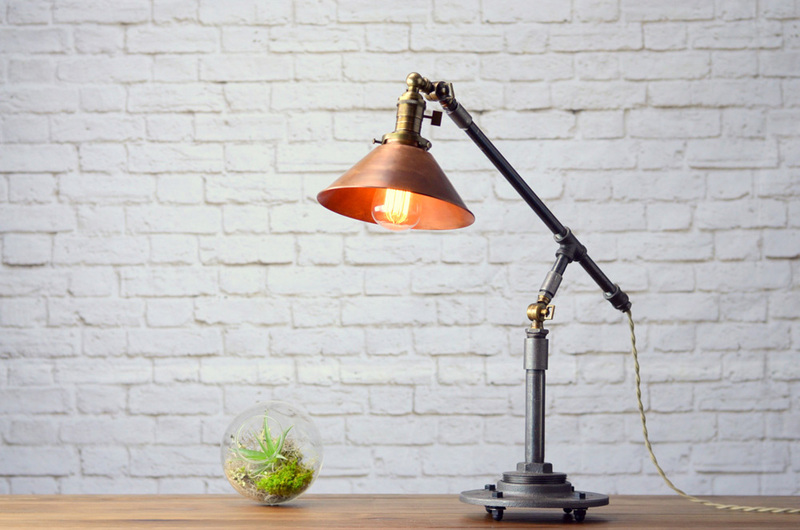 This is a badass lamp whose bright sleekness would be perfect for muted decor . Weighing 3 kgs, these lamps are made of brass and copper. The roughly cut stone base juxtaposed with the shiny metal gives it a vintage charm. Especially perfect for white backgrounds. 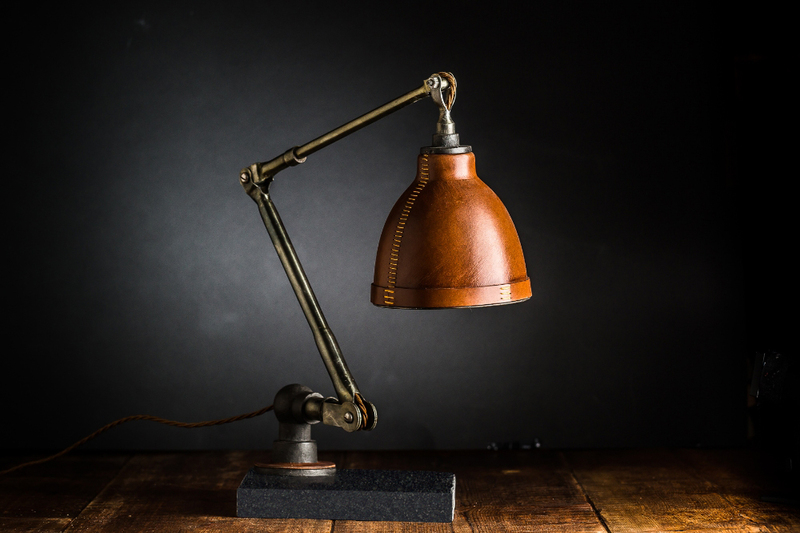 A vintage industrial lamp having the perfect size to fit your bedside table or office table which also functions as a charging station. How more awesome can it be? To protect and enhance the matte finish, the steel for the body has been aged and brushed and given a clear coat which is heightened by the extra-large globe lamp. The safety plugs make this 11.5” x 4” wide lamp perfect for households with children and pets. 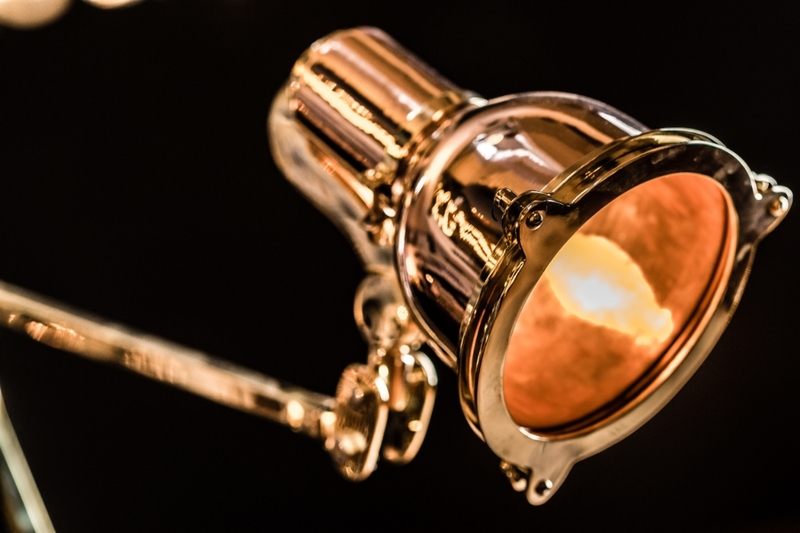 This lamp is for those who get a sensual experience through details. An architecture mini-marvel, it is based on Fibonacci’s spiral which brings together all its parts. Seeking to replicate the characteristics of concrete, the outside has a rough surface while the inside has small steps going into the lamp body which creates its unique rhythm. 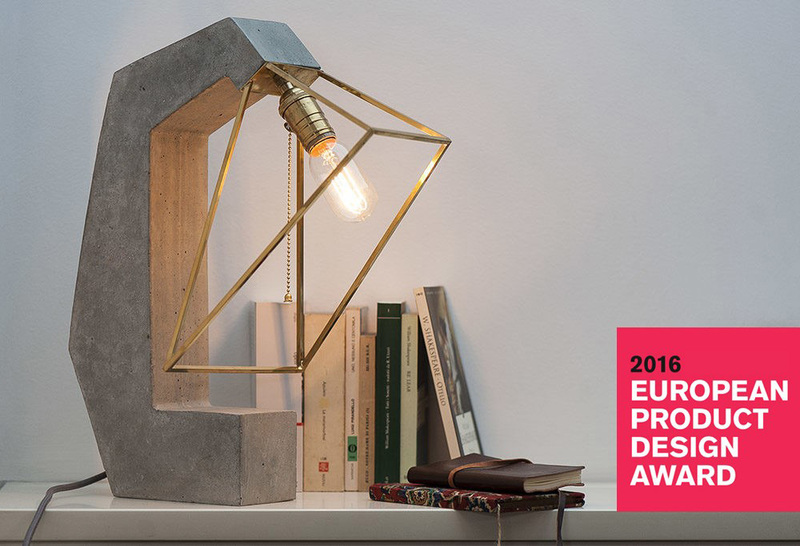 In 2017, this lamp of 7 kgs 470 mm tall won the silver prize in the illumination category in the European Product Design Awards. 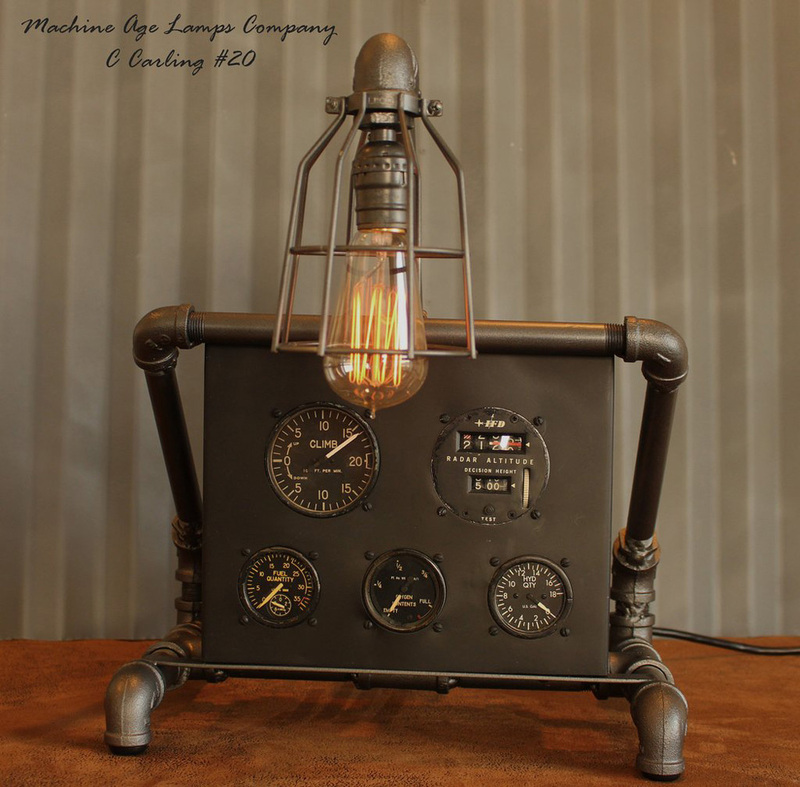 Handcrafted by a maker in Lafayette, Lousiana, this is a worthy re-entry of industrial steampunk lamps in the list. 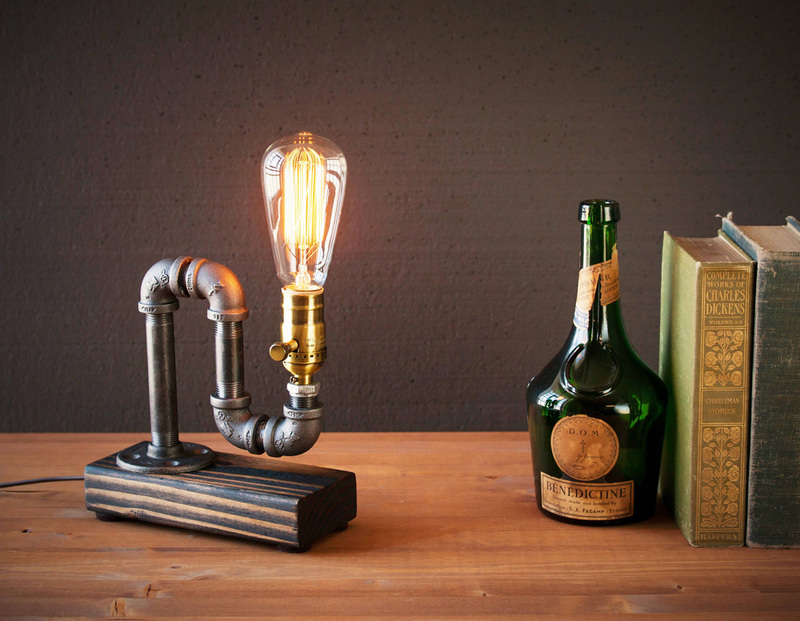 Made with hefty pipes, this features 2 vintage Edison lamps and are for those who want something woke to contrast with their classic goth room deco. A steel product from November Reserve, this lamp in its large yet unique design is perfect as a statement piece on mantelpieces. 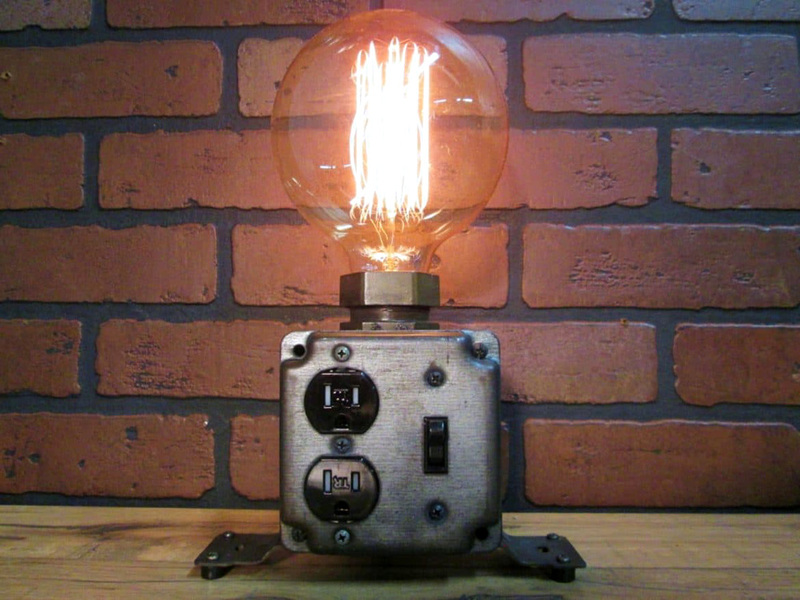 A handmade product, it is made of used metal and features an extra-large Edison bulb. This list just keeps on getting cooler. 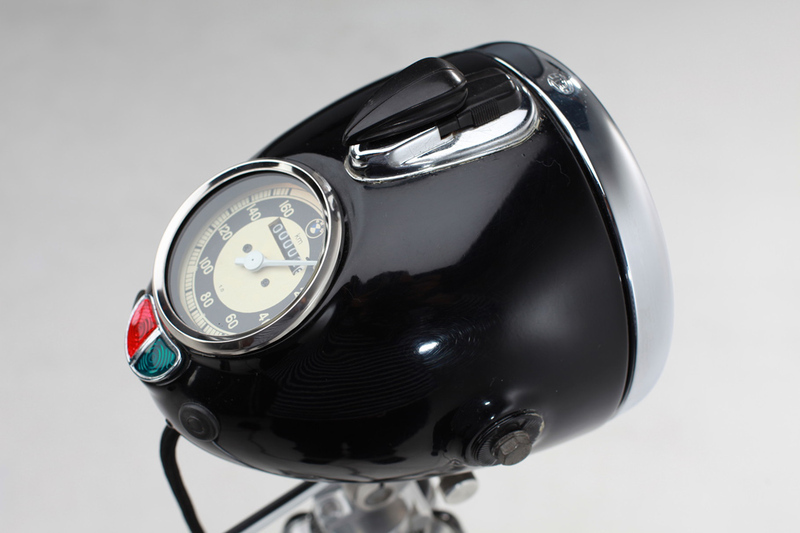 After car lamps and radio speakers, here we are with aviation instruments. 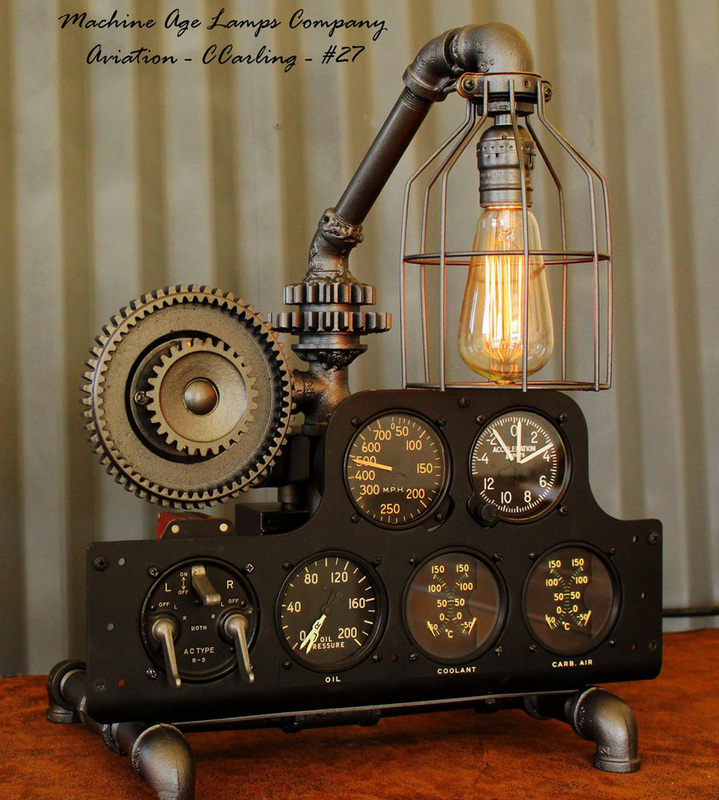 Made with things from salvaged aircrafts, it would give any digital piece a run for its money with its variable intensity dimmer controller located at the back. 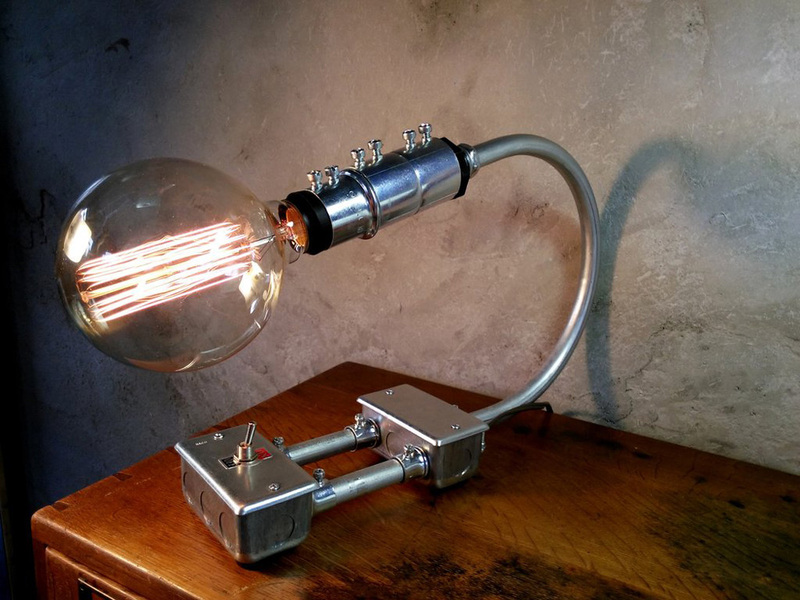 This lamp with a 60 W vintage Edison bulb is extremely secure and durable and also comes with rubber tip protectors to save surfaces from scratching. This takes it a bit further by using all instruments from salvaged WWII P-38 aircrafts . 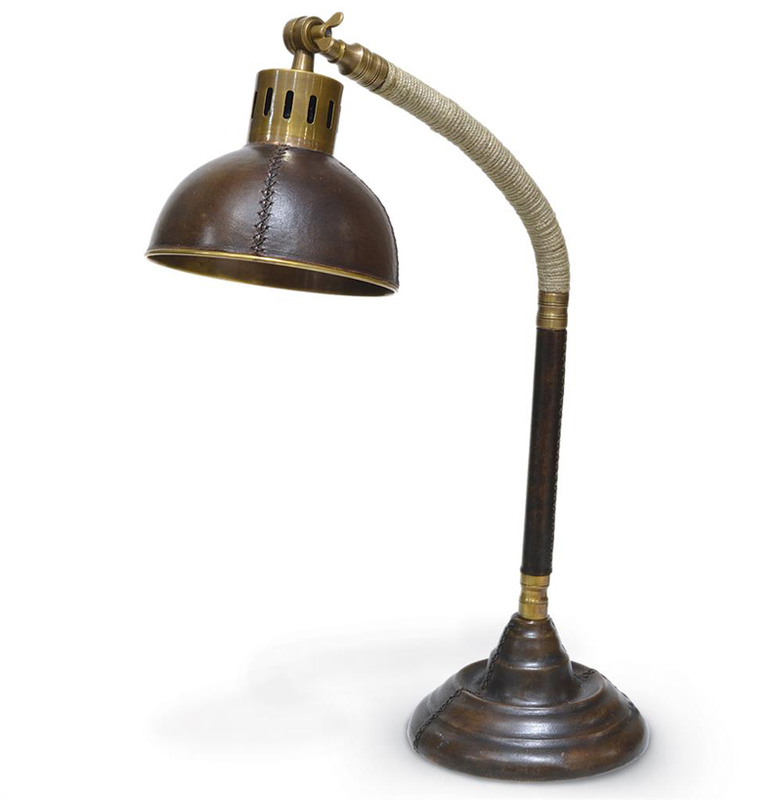 The document coming with this lamp would provide you with the individual history of each of these lamps. For enhanced visual effects, there are four randomly blinking gold LED lights placed in between the gears. There is a toggle switch at the back to control the power, and it is set on a frame of reused black iron pipe, which may be old or new. The 60 W vintage Edison bulb can be replaced with any standard medium sized bulb. This lamp comes with 4 socket variations and 3 wood base finishes for you to choose from while placing the order. These simple yet elegant 8”x 11′ lamps are the perfect gift items and feature an 8F cord and a 40 W Marconi filament Edison bulb included in the purchase. 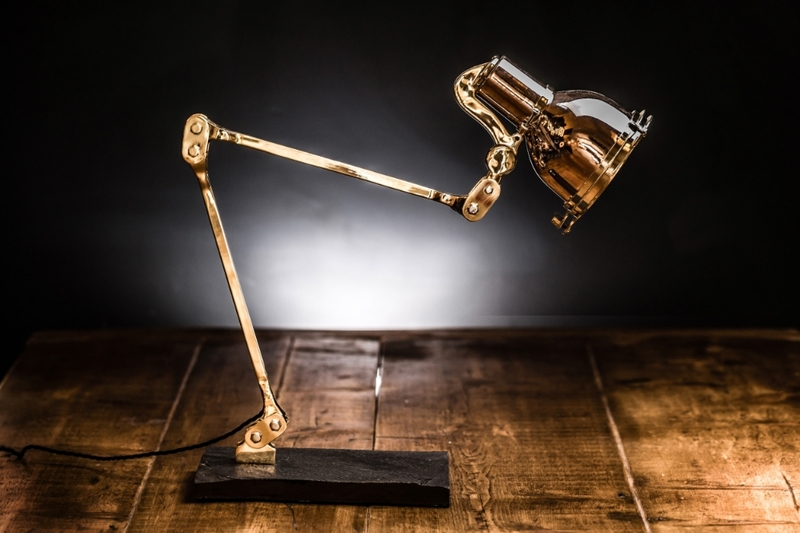 A beautiful departure from your regular mechanical lamps in this list, this custom-built product from Little Anvil is made with a collection of antique brass lamp components fitted onto heavy cast and spun brass base. Inspired by the Star Wars saga, the guard shield is custom made with the rusted club and round steel sheet. 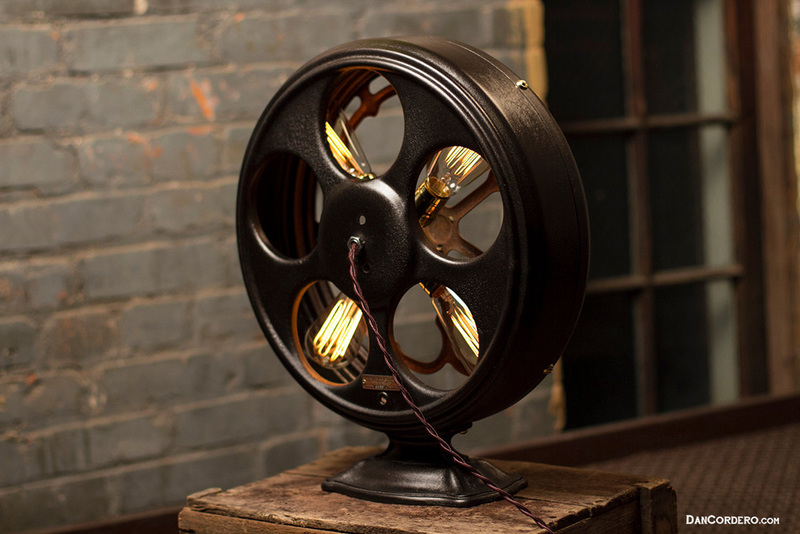 Another carry over from the World War II era, this lamp features the General Electric Vortalex Fans introduced in America in 1938. 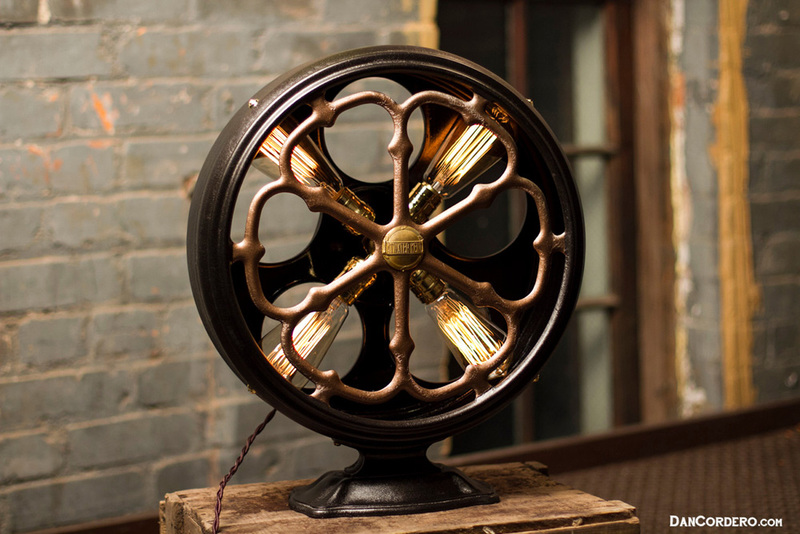 The maker meticulously preserves each and every part of the fan right down to the screws before adding 4 vintage 60 W Edison-style bulbs. 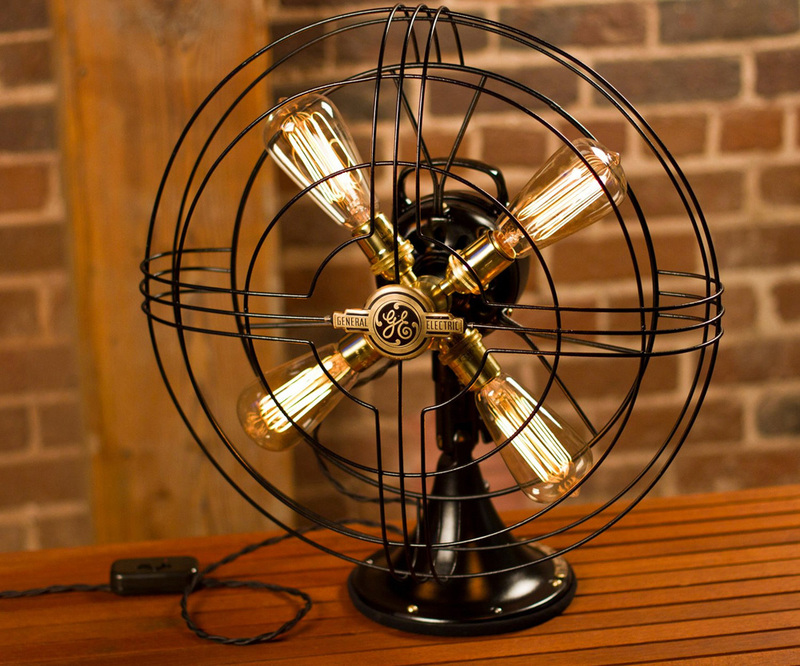 Each lamp made with the Vortalex fan comes with a unique look and you can customize your order. This lamp is just… beautiful. 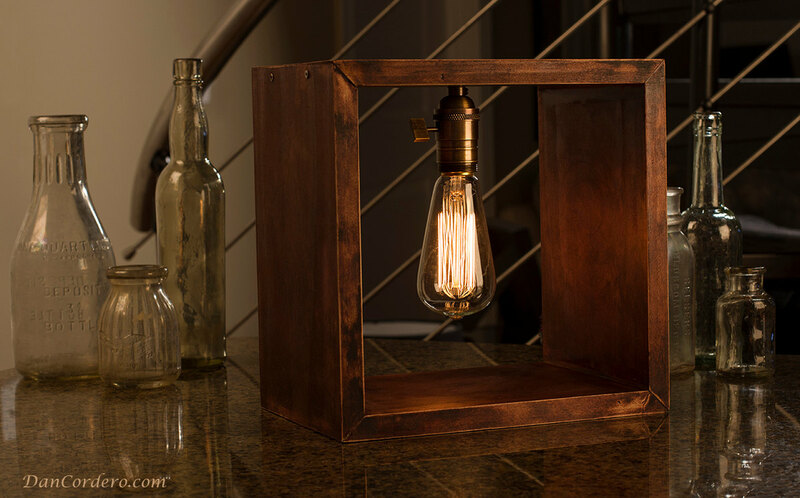 The uniquely handcrafted Shadow Box Edison Lamp is set in a beautiful stained box made of red mahogany. The tilted block enables the lamp to have a contemporary optional angular display. The wiring has been carefully hidden to avoid disturbing the perfection and cleanliness, which is accentuated by an antique brass-finished paddle turn knob socket. This is another piece in beautiful stained red mahogany and features a more angular design than the previous one. It is for those who want their pieces a bit louder. At 14”x9”, this lamp is slightly larger than the previous model and features a 46” twisted zigzag cord in beige or brown. It also comes with a felt base to prevent surfaces from getting scratched. Old is gold, only if it can be made new. Made to fit a 2018 lifestyle, these lamps are also a good steo towards sustainable living.